Romesco sauce is a nut and red pepper-based sauce that originated from Northeastern Spain. The fishermen in this area made this sauce to be eaten with fish. I make jars of it and use it on everything from fish, to chicken to roasted cauliflower and even EGGS! Line 2 baking sheets with parchment paper.Place florets on baking sheets and toss cauliflower in olive oil. Sprinkle salt and pepper evenly. 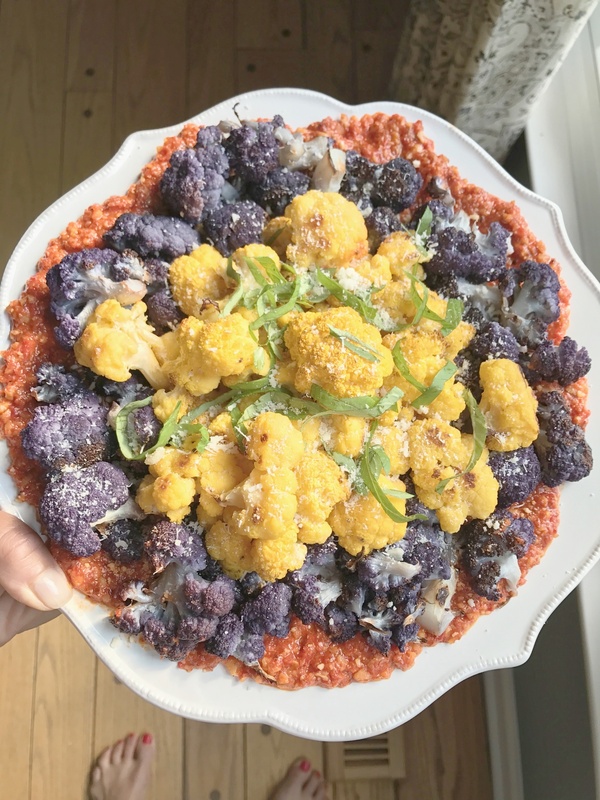 While the cauliflower is roasting, combine all of the romesco sauce ingredients in a food processor. Process until all ingredients are fully combined. The sauce should not be over processed. I like for it to have texture. Generously layer the sauce onto a large circular dish and place the roasted cauliflower on top while still hot. Sprinkle the cauliflower with parsley and grated cheese of choice. I prefer pecorino romano or ricotta salata.